Somewhere along the way, this site had its 15,000,000th page view. I'm grateful to all who have taken the time to write in recent years to offer comments. 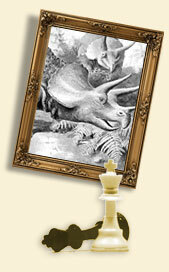 February 2008: Rick Kennedy, long a reviewer whose work I've enjoyed at www.chessville.com, has kindly declared Predator at the Chessboard vols. I & II his favorite books on chess tactics. I'm very grateful to him for giving these books and website a chance to win his affection, and for calling them to the attention of more readers. 9 March 2007: The entire site is now available in book form. The links are at the top of the front page. There are two volumes, each of them 8.5" x 11" (about the size of A4 paper). Taken together they contain over 700 pages of material, with more than 1,000 positions and commentaries. Hardcover versions also are available for those interested; you can search for them at www.lulu.com (which is where the links on the front page lead). At the lower left of the publisher's site, you can ask to have the prices displayed in pounds or euros if you prefer. Many thanks to those of you who have requested this for your encouragement and patience. 22 May 2006: The Chess Quizzer is back. This very valuable part of the site has led a difficult existence. It was up and running, and quite popular, for a while last fall, but we had to take it down because it caused some problems for our server. Now we have made some adjustments and are trying again. It's a great function, and I would like to thank James Skelley and Alon Cohen (again) for their work on it, and also to express my gratitude to the technology staff at BU for their help and patience. Give the Quizzer a try. I am delighted to report that the Chess Quizzer has arrived (though at this writing it is down for a few days for maintenance). This is an exciting new feature of the site that allows you to quiz yourself on positions from the book. First you decide whether to try a position from anyplace in the manuscript or to narrow the choice down to a particular section of it. Whichever option you choose, a position is given to you at random with no information except which side is to move. If you ask for a hint, you will be told which section and chapter of the book the position came from; then you also can click to reveal the solution—which consists simply of the discussion of the position from the book. I hope you will find the result is fun, and a useful way to test your grasp of the ideas taught elsewhere on the site. The Chess Quizzer is made possible by the architectural wizardry of Alon Cohen, to whom no technical or design challenge appears to be too tall. We all can agree, I should think, that he has done a brilliant job, and that this new marvel is up to the same high standards of beauty and usefulness set by the original part of the site (standards set, I should add, by the identical Alon Cohen). Bugs are not uncommon in a new feature of this sort. I invite the usual comments and corrections. I have, for example, tried to exclude any positions that don't belong in the quiz, whether because they illustrate tactical ideas that fail or because they are pictures of dinosaurs. If you come across a misfit, let me know and I will promptly remove it from the quizzer. I am pleased to say that the Chess Journalists of America have given this site their 2005 award for best chess instruction on the web. As the front page of the site mentions, a new feature will be arriving soon: The Chess Quizzer. It will allow you to test yourself on random positions from the manuscript (or from any section of it you choose) with the explanations kept out of view. You will be able to ask for a hint, and in reply will be told where in the book the position came from. Then you can reveal the solution and try another. I think many readers will find this a valuable addition to the site; for after reading the manuscript, one naturally wants to practice on positions where the theme isn't known in advance. I have been working on this for a while with my brilliant and intrepid web design expert, Alon Cohen, and it's coming along beautifully; Alon's genius will be evident when you try the feature. It should be running sometime in September. This site made its entrance to the world back in April 2005. Since then it has had more than 20,000 different readers. A hearty to welcome to all, and especially to those who have taken the time to write with comments, suggestions and the like. It is a high pleasure to hear from you. Many thanks to all, and do stay in touch.